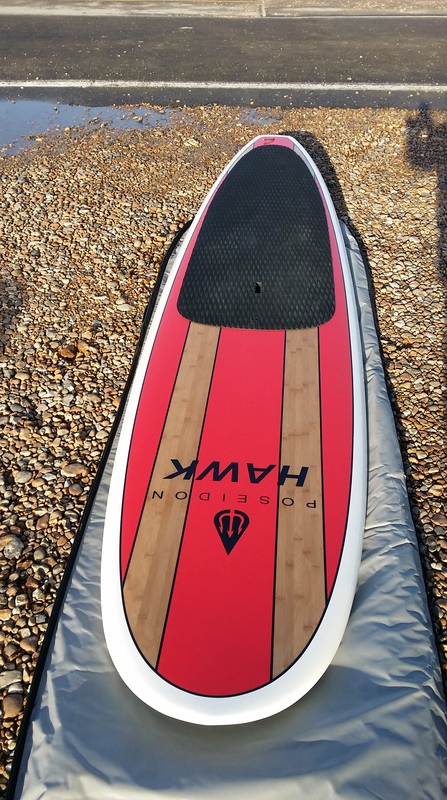 Another new kid on the block, Poseidon SUP are UK based and produce cost-effective stand up paddle boards for those not wanting to break the bank. Their 12.6ft all rounder is designed for general recreational paddling, small waves and messing about at the beach. The 12.6ft isn’t the lightest of boards but it should be noted that the construction is pretty bombproof, ensuring little knocks and scrapes are brushed off fairly easily. The red and white paint job, with bamboo veneer poking through, makes for an easy on the eye product. Plastic fins (that you’ll probably want to swap out in time) complete the look. Heading off, it’s a very composed and sedate ride across flat water. Even with coastal chop bombarding the 12.6ft there’s plenty of stability and beginners or early intermediates will appreciate its non-threatening personality.